Porous ceramic ball for Filtering is used to for supporting and covering the catalyst, as well as for filtering and eliminating the impurities of grain, gelatin, asphaltite, heavy metals and iron etc. 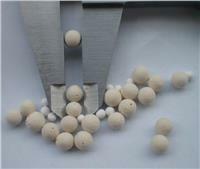 This super Ceramic Filtering Ball is made by make 20~30% pores inside the inert ceramic balls. Therefore it can be used not only for supporting and covering the catalyst, but also for filtering and eliminating the impurities of grain, gelatin, asphaltite, heavy metals and iron ions of less than 25μm. If the porous ball is set on the top of a reactor, the impurities fail to be eliminated in former process could be adsorbed in the pores inside the balls, thereupon protect the catalyst and prolong the operating cycle of the system. As the impurities present in the materials are different, the user can select the product by their sizes, pores and porosity, or if necessary, add molybdenum, nickel and cobalt or other active components to prevent the catalyst from coking or poisoning.